meeting to present evidences based on research and lived experiences that highlight strong links between disability and development. All participants at the inquiry univocally emphasized the need to mainstream disability issues as part of a strong international development program. Despite the presence of the UN Convention on the Rights of Persons with Disabilities-2006 (CRPD) and the international obligations to support disability communities under the Convention, many DPO representatives expressed their dissatisfaction over the grave international inaction on addressing disability issues in developing countries. According to the World Report on Disability 2011 , over one billion people – 15% of the world’s population- are disabled. Around 80% of people with disabilities (PWDs) live in developing countries. Out of them, 98% are unemployed. Over 90% PWDs are out of school. The majority of PWDs are trapped in the vicious cycle of social exclusion, poverty, disease, malnutrition and death. During conflicts and disasters, PWDs are the worst victims of neglect and damage. Of the many disability categories, the situation of people with mental health problems and psychosocial disabilities, and intellectual disabilities is the most neglected. 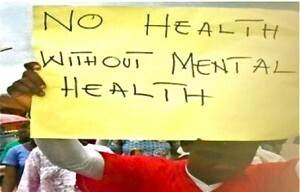 Those with mental health problems and psychosocial disabilities are marginalized within the disability groups. In this context, the Center for Global Mental Health, CBM International and the Nepal Mental Health Foundation had submitted a joint inquiry submission to persuade the Inquiry Committee to include mental health and psychosocial disability issues in DFID’s future development programs. Prof. Graham Thornicroft was invited from our group. He presented mental health as a strong case for international development. While the inquiry was underway, I was also invited by the chair of the International Development Committee Rt Hon Sir Malcolm Bruce for an informal meeting to discuss the experiences and situation of mental health issues in developing countries, mainly of Nepal. It was a great opportunity for me to share the ordinary ground experiences of psychosocial disability and mental health in the hopes that DFID might take international leadership to address these issues. Dr. Mary DeSilva from the Centre for Global Mental Health made my meeting possible with the Chair and, in fact, Mary herself has been playing a lead role in an effort to sensitize British parliamentarians about the tragedy of mental health issues and the routine human rights violations of people with psychosocial disabilities in developing countries. My meeting with the Chair went well. He seemed quite concerned about the lack of educational, economic, social, health and livelihood opportunities of people with mental health problems and psychosocial disabilities in developing countries. The protection and promotion of human rights, quality health care and social inclusion were the main issues discussed with the Chair. As I informed the Chair, in international development, money isn’t the only factor. Sometimes, moral solidarity can be more important than the value of money. For millions of people with psychosocial disabilities in developing countries who are invisible and unheard in the society, moral solidarity from the donor community to protect and promote their human rights should be the first concern. There are so many “No Cost” interventions where donor agencies can provide genuine moral support and solidarity. If the donors begin by allocating small resources matched by moral solidarity, it would go a long way to transform the millions of lives of people with mental health and psychosocial disabilities in poor countries. I hope DFID will take both “No Cost” and “Low Cost” international leadership in this sector.